Well, summer has come and (almost) gone in a matter of moments, it seems. My fingers and toes* are crossed in the hopes that autumn is cool, crisp, and filled with cozy sweatshirts and crackling bonfires. And in no hurry to hand the baton to winter. And, since life doesn't seem to slow down just because I wish it would, I was pretty happy that the Babes baking adventure for this month was a (relative) quickie. 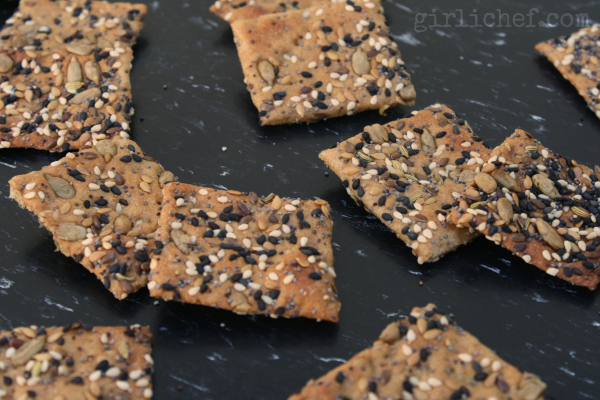 We pushed aside our bread pans, and pulled out our rolling pins - and enough seeds to make all the birds in my neighborhood happy for weeks - and we got crunchy. I did this in my bread machine, but you can do it by hand or in a mixer with a dough hook. 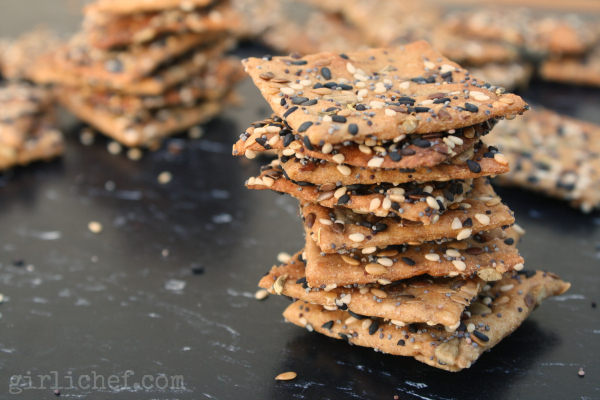 Combine all of the dough ingredients except the sesame seeds and knead until you have a slightly tacky dough. Add the sesame seeds, and continue to knead for a couple of minutes. Form into a ball and set aside, covered, until slightly risen, 60-90 minutes. Turn dough out onto a work surface (I didn't need any flour), and divide in half. Wrap one portion and set aside. At this point, you could refrigerate it and make it later, if you like. Set onto a large cutting board, and roll into a rectangle that is approximately 14" x 9", and no more than 1/8" thick. Lift up and set onto a piece of parchment paper (you'll see why in a minute). Flick the surface with water and then sprinkle 1/4 of the seed mixture over the top. 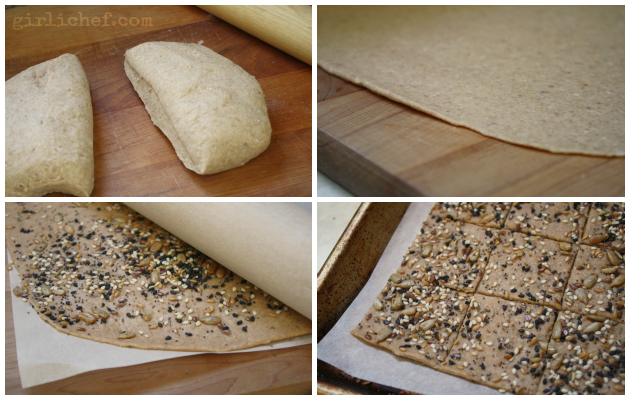 Set a piece of parchment paper over it and gently roll a rolling pin over it to press in the seeds. Set a baking sheet upside down, on top of the parchment, and flip it over all in one fell swoop. Flick this side with water, sprinkle with another 1/4 of the seeds, top with parchment and roll. If you have enough room in your oven, you could repeat the process with your other half of dough now, or save it for later. Sprinkle with sea salt, to taste. Prick the dough all over with a fork, and use a pizza roller (or something similar) to cut into shapes. Let sit and rise briefly, 30-40 minutes; they will puff just slightly. Preheat oven to 350° F during last 15 minutes of rise time. 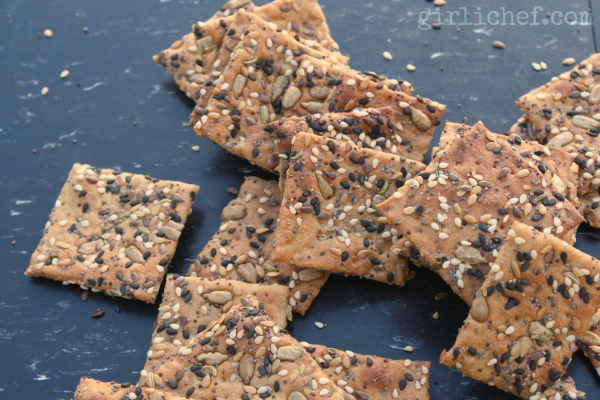 Slide into oven and bake for 20 minutes, until the crackers are a medium brown. Turn the oven off, and crack the door. Let cool completely in the turned off oven. Break apart as needed. Store in an airtight container. *Okay, that's an out-and-out lie. I have the tiniest toes on the face of the universe. They don't cross. If you'd like to bake along as a buddy this month, head on over to the hosting Babe's kitchen for this month, Tanna at My Kitchen in Half Cups, for the base recipe (you're welcome to adapt) and any special instructions. Then send her your post by September 29th to receive your buddy badge and be included in the Bread Baking Buddy roundup. I hope you join us!